Melania Trump has been walking on red soles for most of the first two days of her visit to Europe. The first lady, 48, was photographed on Wednesday wearing her fourth pair of pumps by the French designer in 48 hours, having paired her cream-colored high heels with a $7,450 white Elie Saab dress. 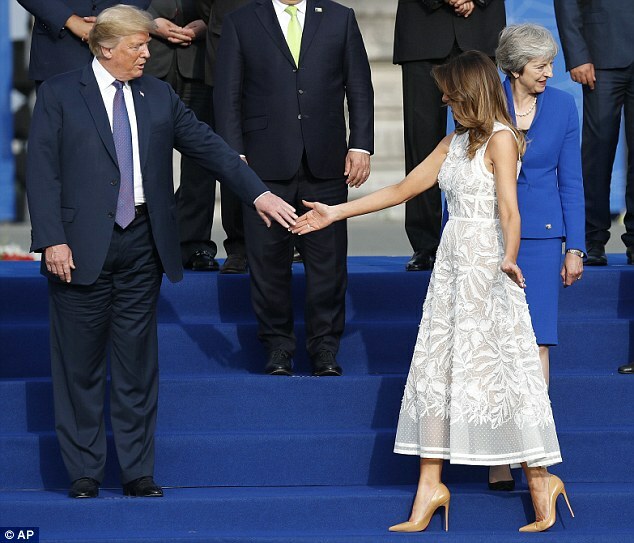 Earlier in the day, Melania wore a navy dress by Belgian designer Raf Simons and white Louboutin pumps, sticking with the French label after wearing two pairs of shoes by the same brand on the previous day. Melania joined her husband, other leaders, and their spouses in Brussels on Wednesday evening prior to a dinner as part of the Nato summit. 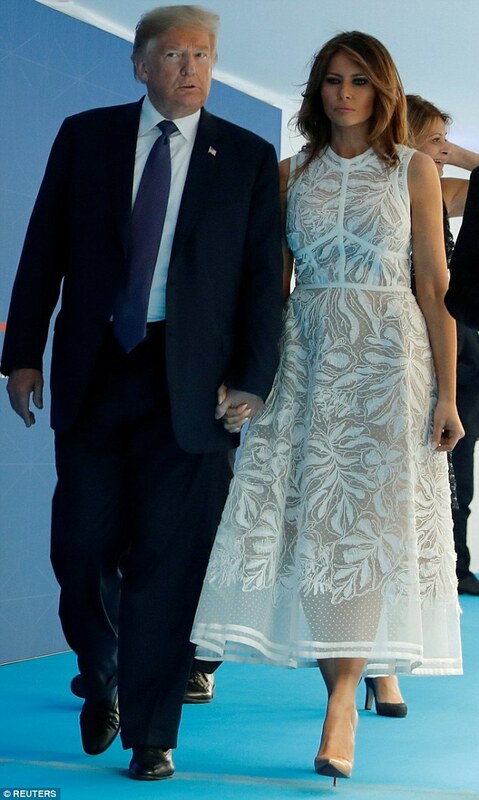 She had dressed up for the occasion in her sleeveless, embroidered tulle cocktail dress by Lebanese designer Elie Saab. Keeping her outfit simple, she went for beige Louboutins, with the French label’s trademark red soles bringing a pop of color to her outfit. The first lady smiled as she and other attendees, including her french counterpart Brigitte Macron, 65, and French president Emmanuel Macron, 40, gathered for an evening reception and dinner in the Belgian capital. 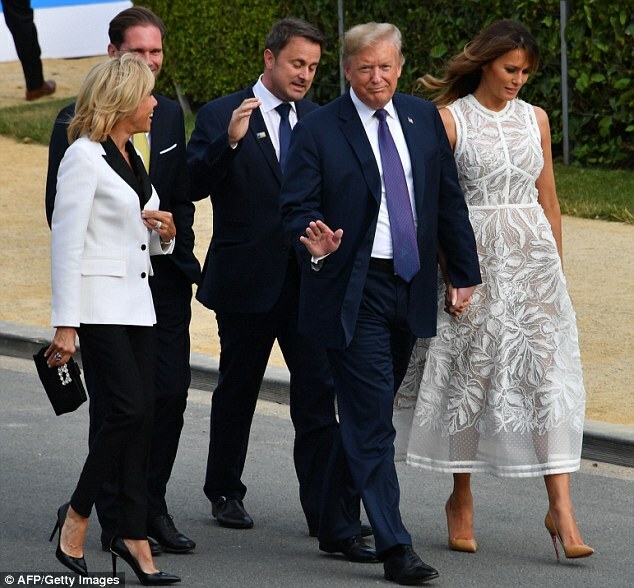 President Donald Trump, 72, was seen greeting Brigitte as he prepared to pose with other heads of state and their spouses at the Parc du Cinquantenaire in Brussels. Melania kissed Emmanuel on the cheeks, as the president did with Brigitte, as is customary in France. 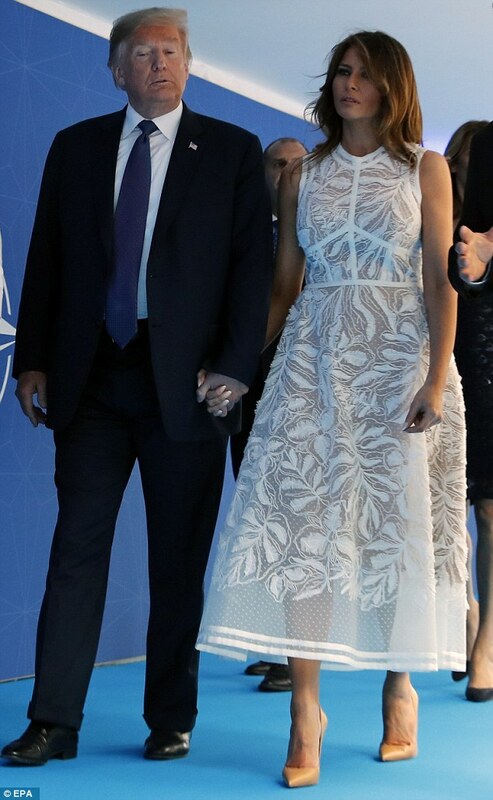 Earlier on Wednesday, Melania paid a tribute to the Nato summit’s host nation by wearing a dress by Belgian designer Raf Simmons. The first lady donned the navy number while visiting a music academy in Waterloo, Belgium, near Brussels, while her husband and other leaders met in the capital. Melania arrived wearing a sleeveless $2,430 Calvin Klein dress with a cinched waist and white and green detail on the lapel. Raf, a native of Neerpelt, Belgium, is Calvin Klein’s chief creative officer. The first lady stopped with other spouses at the Queen Elisabeth Music Chapel, where she was photographed laughing and chatting with French First Lady Brigitte. She paired her navy dress with white Louboutin pumps featuring the French label’s signature red soles. The white pumps were the third pair of Louboutins Melania wore publicly over the course of two days. Melania is usually a fan of Manolo Blahnik’s shoes, and has often stuck with the Spanish designer during public outings. But she has so far remained loyal to the French brand during her European trip, a choice that seemed especially fitting when she caught up with her French counterpart. 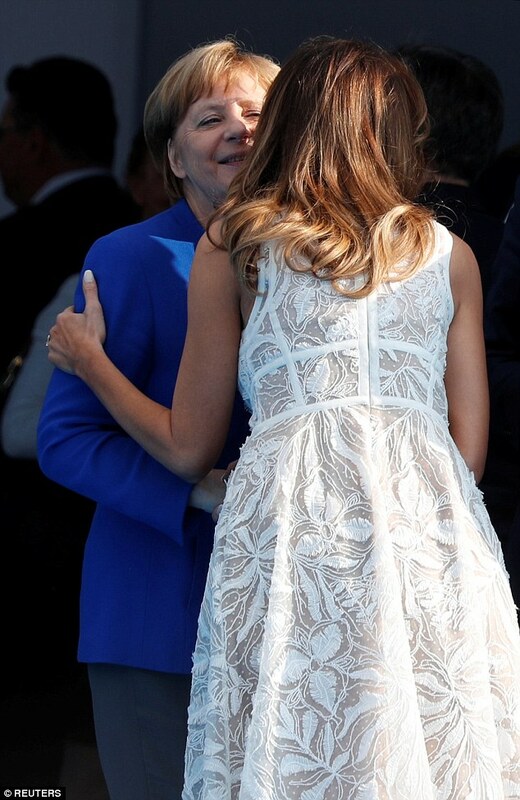 The two first ladies, who have met in the past, including when the Trumps hosted the Macrons during a state visit in April this year, seemed thrilled to be in each other’s company again. They sat next to each other for a concert and were seen smiling and laughing together during the gathering. Brigitte wore an all-white ensemble, going for a skirt and matching jacket, while her hair was arranged in her signature blonde bob with bangs. The spouses were welcomed to the music center by Amelie Derbaudrenghien, the partner of Belgian Prime Minister Charles Michel, and Ingrid Schulerud, the wife of NATO Secretary-General Jens Stoltenberg. They toured the center and attended a piano and violin concert. 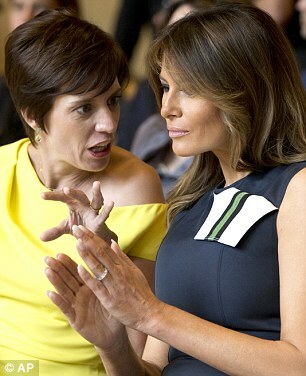 Other participating first ladies included Emine Erdogan of Turkey and Belgian Prime Minister’s partner Amelie Derbaudrenghien, who sat on Melania’s right while Brigitte was on her left. 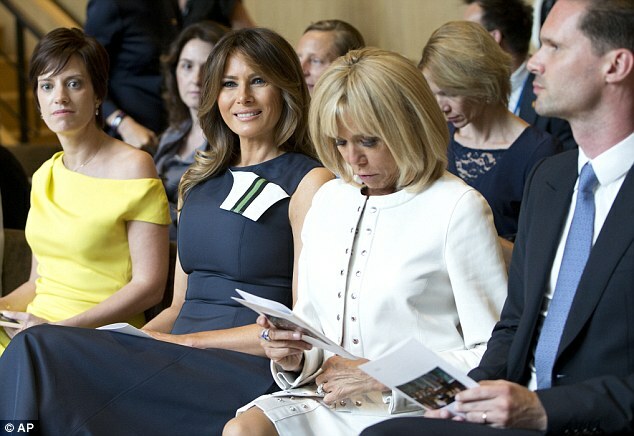 Melania, who seemed in high spirits during the event, posed with the rest of the spouses for a group photo between Brigitte and Amelie, who wore an asymmetrical yellow dress. On Tuesday, Melania unveiled the first of her four pairs of Louboutins when she was photographed leaving Washington, D.C. wearing $795 beige and red pumps by the French designer. She walked across the South Lawn of the White House to board Marine One in the high heels, which she paired with a $975 long, beige safari skirt by Martin Grant tied at the waist by a belt, and a quarter-sleeved red sweater with a round neckline. Melania’s red soles were in full view as she climbed the steps to Marine One. Louboutin’s name is also scribbled on the top of the pumps, which, according to the brand’s website, are inspired by Paris’ neighborhood of Pigalle and places such as the Moulin Rouge cabaret and the Divan du Monde concert hall. They are made with Kraft paper, which itself comes from Louboutin’s shopping bags and shoe boxes, and is hand-torn before being placed under PVC. Each piece, the website states, is ‘unique’ and has an ‘audacious new trash flair’. 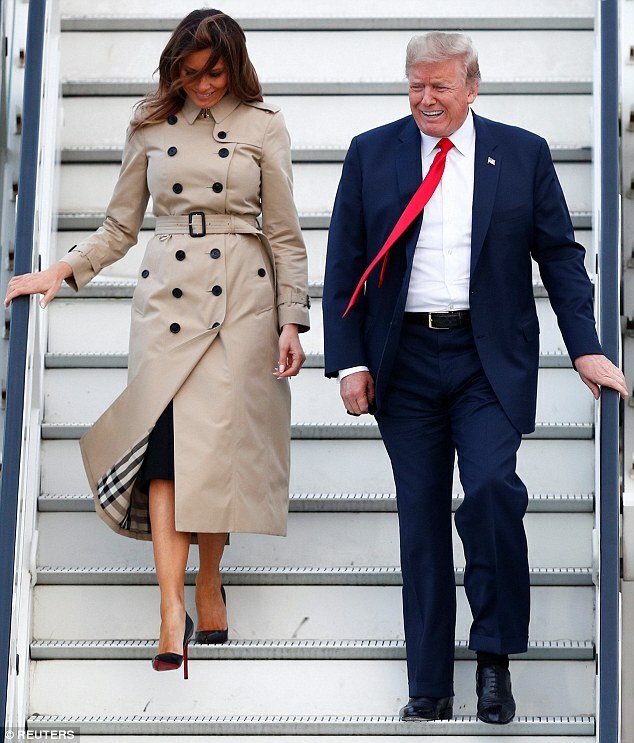 By the time she landed in Belgium, later on Tuesday, she had changed on the plane and unveiled another pair of Louboutins as she stepped off Air Force One, this time having opted for classic black pumps. The shoes, of course, also have the trademark red soles that make Louboutin shoes easy to spot from afar. She paired the vertiginous pumps with a beige Burberry trench coat featuring a plaid lining, which she buttoned all the way to the top and wore cinched at the waist by a belt. Classic, double-breasted trench coats from Burberry range from $1,990 and $2,090. 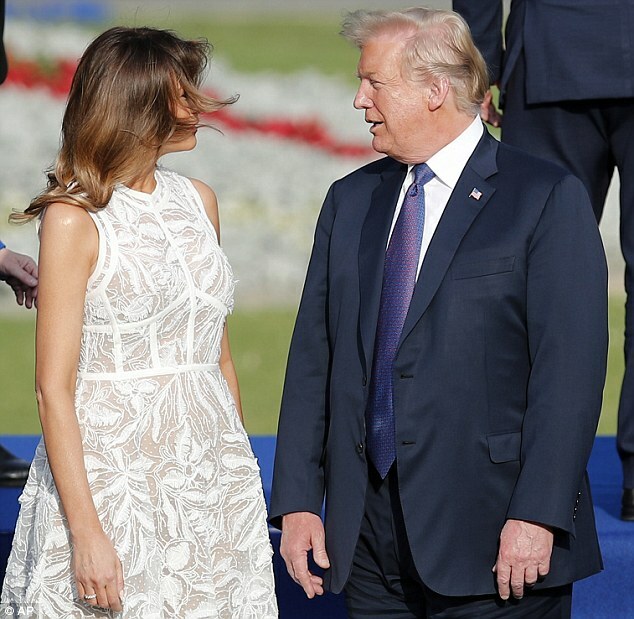 On Wednesday, while Melania and other spouses visited the music academy in Waterloo, President Trump opened the Nato summit with a blistering attack on Germany. He called it a ‘captive’ of Russia as he ramped up demands for Nato allies to pay more for their collective defense. Arriving in Brussels for a two-day alliance summit, the president said it was ‘totally inappropriate’ that Germany was paying billions of dollars to Russia for oil and gas while spending little more than one per cent of its GDP on defense. He said the deal to build a new pipeline meant Germany was now ‘totally controlled’ by Moscow. German Chancellor Angela Merkel hit back, saying that having experienced life in Soviet-controlled former East Germany, she was glad they could now ‘determine our own policies and make our own decisions’.